B.J. McLeod picked up the 1st last-place finish of his Monster Energy NASCAR Cup Series career in Sunday’s Gander Outdoors 400 at the Pocono Raceway when his #51 Jacob Companies Patriotic Chevrolet lost the engine after 77 of 164 laps. The finish came in McLeod’s 16th series start. In the Cup Series last-place rankings, it was the 21st for car #51, the 682nd for engine trouble, and the 751st by a Chevrolet. Across NASCAR’s top three series, it was the 33rd for the #51, the 1,061st for engine trouble, and the 1,616th for Chevrolet. McLeod is a name that has steadily become more of a presence in NASCAR. 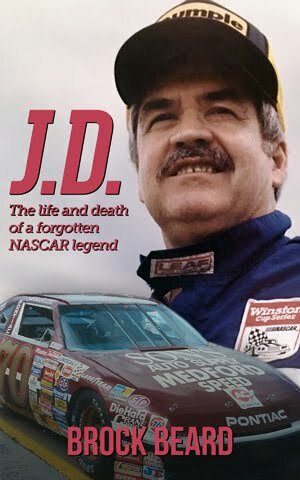 The native of Wauchula, Florida is most readily known for his three-car XFINITY Series operation, B.J. McLeod Motorsports. The founding of the team in 2016 was the culmination of a career that began when McLeod was racing ATVs at age three. He graduated to go-karts at five, Super Late Models at 13, and on June 2, 2001, became the youngest driver to start an ASA race. Just 17 at the time, McLeod finished 15th in a race at Nashville won by Johnny Sauter. In 2010, McLeod joined the NASCAR tour as an infrequent competitor in the Camping World Truck Series, and on October 23rd of that year finished 17th in his Martinsville debut for Germain Racing. He began working with team owner Christopher Long later that season, and ran ten races in 2015 driving the #45 Tilted Kilt Chevrolet. That same season saw his XFINITY debut for Rick Ware at Iowa, a 36th-place finish, and B.J. McLeod Motorsports opened its doors the following season. The current incarnation of McLeod’s team has seen near-weekly driver changes between the full-time #78 and #8 Chevrolets and Toyotas, plus the part-time #99 team. 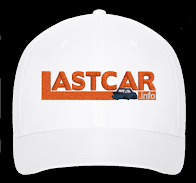 Joining McLeod have been such drivers as Angela Ruch, one of Derrike Cope’s nieces, 2000 series champion and LASTCAR record holder Jeff Green, and outspoken underdog Tommy Joe Martins. This diverse lineup turned in several strong runs last year. Martins impressed at Iowa, challenging for a Top Five late before he slipped to 11th. Green paced the field at Talladega for 18 green-flag laps before finishing 10th. And David Starr surprised with a team-best 5th-place finish in Daytona. It was during this same 2017 season that McLeod first drover for Rick Ware Racing in the Cup Series. 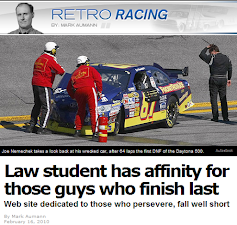 He’d made just one Cup start prior to that, finishing 34th at Loudon for Circle Sport. Taking over the #51 Chevrolet at Ketucky, McLeod finished under power once again, taking 32nd. It was the beginning of a relationship that continues to this day. As of this writing, every one of his subsequent Cup starts have come in Ware’s #51. McLeod drove double-duty last weekend, driving in both the Cup and Truck Series races at Pocono, and was also represented as team owner for the stand-alone XFINITY Series race in Iowa. On Saturday morning, McLeod finished 24th in Mike Harmon’s truck, one lap down to the leaders. Meanwhile, in Iowa, Tommy Joe Martins finished 21st in his #78 Riessen Construction Chevrolet while Ray Black, Jr. steered the #8 JW Transport Chevrolet to a 28th-place finish. 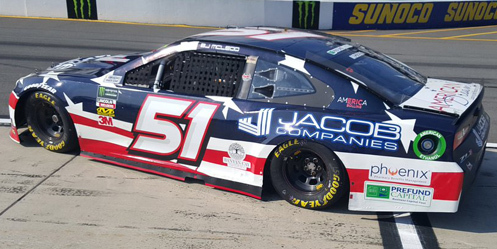 For Pocono’s Cup race, McLeod drove the same patriotic-schemed #51 Jacob Companies Chevrolet he drove to a 34th-place finish at Loudon. Judging from the red-white-and-blue paint scheme, it also appeared to be the same car as the #52 SBC Contractors Chevrolet that Cody Ware debuted last month at Sonoma. 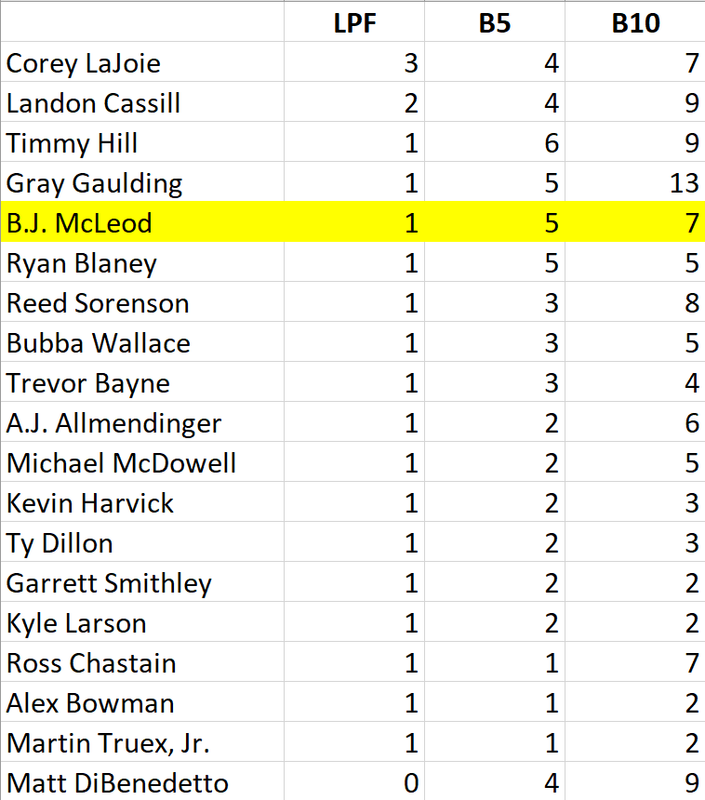 McLeod was slowest of the 39 drivers who turned laps in opening practice, then passed Timmy Hill in Happy Hour to rank 38th. McLeod looked set to start alongside Hill’s new Lehigh Valley Phantoms Toyota in the final row on Sunday until no less than 13 drivers had their times disallowed for post-qualifying technical infractions. The result hoisted McLeod to 26th with a lap of 165.789mph (54.286 seconds), nearly four full seconds off the new pole speed set by Daniel Suarez. The new last-place starter was Kasey Kahne, whose #95 Procore Chevrolet was the lowest-ranked of the 13 disallowed entrants in Owner Points. 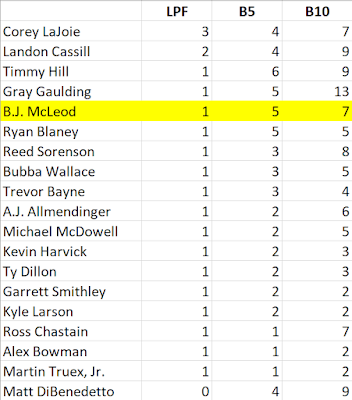 Kahne also incurred a redundant tail-end penalty for an engine change, joining the unapproved adjustments on J.J. Yeley’s #23 Steakhouse Elite Toyota for BK Racing and the #15 Premium Motorsports Chevrolet, practiced by Gray Gaulding while Ross Chastain was competing in Iowa. Excitement over big-name drivers starting at the tail end of the field was tempered somewhat with one lap before the green flag, when no less than seven drivers pulled out of line and slowed on the inside down the frontstretch, purposefully falling to the rear. Joining the penalized Chastain and Yeley were StarCom Racing teammates Kyle Weatherman (started 23rd in the #99) and Landon Cassill (24th in the #00), Reed Sorenson (25th in the Premium #7), Timmy Hill (27th in the #66 for Motorsports Business Management), and McLeod’s #51. Despite Kahne’s engine change penalty, he slotted in ahead of these drivers, lifting him from 40th to 33rd. In addition, Kevin Harvick climbed from 29th to 22nd, and eventual race winner Kyle Busch from 28th to 21st. The battle for 40th place on Sunday proved surprisingly competitive. Entering the very first corner, Timmy Hill and Reed Sorenson raced door to door until Sorenson cleared himself off Turn 2, dropping the #66 to last. Several lengths in front of them, 21st-place starter Corey LaJoie slid up the track, directly in the path of Joey Logano’s closing #22 Shell / Pennzoil Ford. As Logano caved in the nose of his machine, the sliding LaJoie clipped the left-rear tire of McLeod’s #51, passing to his high side. This appeared to cut down that tire, for McLeod made an unscheduled pit stop on Lap 2 for fresh rubber. McLeod returned to action on Lap 3, the first driver to lose a lap to the leaders. By the eighth lap, he was closing in on 39th-place runner Timmy Hill, who was himself three seconds back of Weatherman’s #99 in 38th. By Lap 16, McLeod’s tires had fallen off to match his competitors, and he lost a second lap to the leaders. On the 34th circuit, three laps after losing his third, McLeod was in the middle of a close call. The spotter told him to hold his line behind Jeffrey Earnhardt’s #96 Toyota as a resurgent Logano and Chris Buescher split between the pair up high and Cassill down low. On the 36th circuit, Chastain entered the last-place picture when he slowed with an apparent dropped cylinder. He made it to the garage, where the crew examined the fuel pump. By Lap 40, he had taken last from McLeod. Chastain returned to the track following the end of Stage 1 on Lap 51, 16 laps behind and still in 40th place. Next to challenge were both Timmy Hill and the #37 Scott Products / Viva / Hidden Valley Chevrolet of Chris Buescher, who each made it to the garage within a couple laps of each other. By Lap 60, Buescher had fallen to 38th, six laps behind the leaders, while Hill sat 39th, 11 circuits behind. MBM team owner Carl Long posted on Facebook that Hill’s #66, Chassis No. 819, was being run for the first time, and something broke in the front end. The team made several handling adjustments before the car rejoined the race on Lap 68, two circuits after the #66 took last from the #15. Buescher’s crew tweeted that the #37 had a leak in the rear end, and the crew needed to replace the transmission. This new transmission had issues shifting into reverse, and the leak added to the delay as the crew wanted to make doubly sure it had stopped. Buescher slipped to last on Lap 75, then got rolling again on Lap 83 after Corey LaJoie crashed hard in Turn 3 to bring out the yellow. Buescher waited at the garage exit for pit stops to complete before he rejoined the race, 30 laps down. LaJoie averted the “Crash Clock” and rejoined the action three laps down, though the driver had misgivings about continuing. Chastain passed McLeod the next time by, and the #51 slowly dropped down the rankings before finally taking last on Lap 114. Finishing 39th was Corey LaJoie, whose #72 Monarch Crypto Wallet Chevrolet lost the brakes in Turn 3 and slammed the outside wall on Lap 83. The crew managed to avoid elimination under the “Crash Clock,” returning to action three laps down, but the driver had reservations about continuing as he didn’t want to risk another crash. By Lap 101, LaJoie was back in the garage again. While the crew’s twitter indicated they were again trying to return to action, they soon called it a day, and slipped to 39th with crash damage as the officially listed cause. An accident also eliminated 38th-place Brad Keselowski, who cut down a right-rear tire in the Tunnel Turn and backed his #2 Alliance Truck Parts Ford into the outside wall. Chris Buescher’s second transmission still wasn’t functioning properly, and he was behind the wall again in the race’s final moments. Rounding out the Bottom Five in 36th was Hill, the final driver to finish under power. 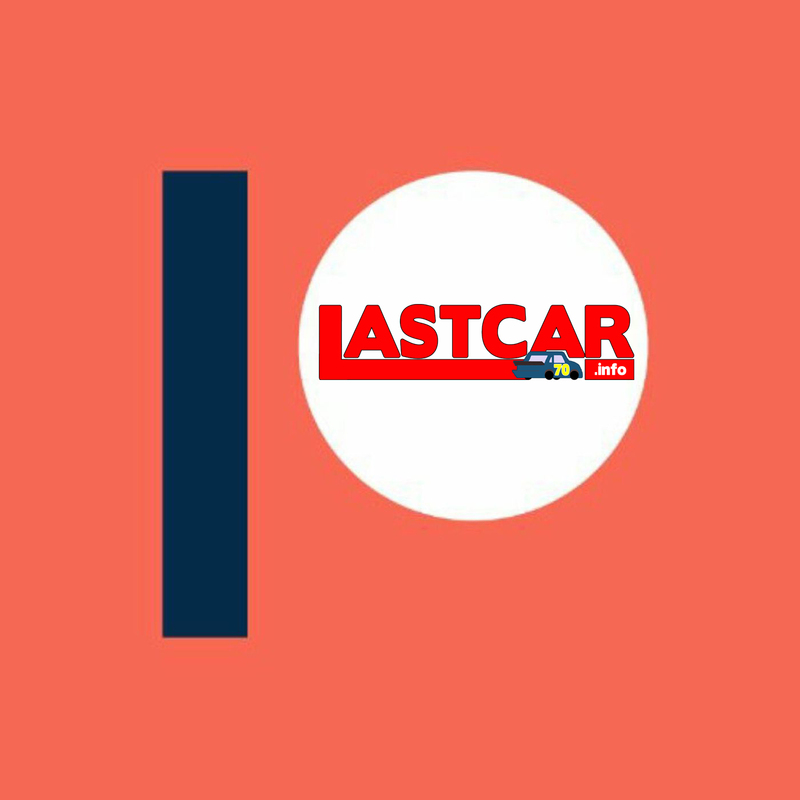 Carl Long confirmed that MBM will focus exclusively on the XFINITY race at Watkins Glen with their next Cup race to be announced. *This marks the second time in three Pocono races that Rick Ware Racing’s #51 Chevrolet trailed a Cup race at the track, following Cody Ware’s vibration on June 11, 2017, when the car was sponsored by the Clemson Tigers.